Stephen’s article was first published in the Huffington Post on 18 July 2017. The London Family Planning Summit held in London last week was heralded a major success. At least $2.5 billion was committed for reproductive health services. New partners and countries signed up to the 2020 targets and the fundamental rights of women and girls was once again justly championed to a world which seems increasingly macho and cruel. 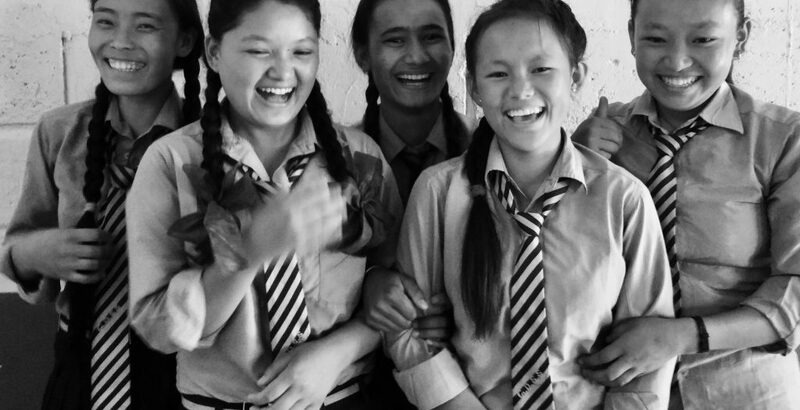 At the same time, four and a half thousand miles away on a Himalayan hillside, just a few valleys south of the Chinese border, the theory of change being espoused from London seemed a world away from the everyday lives of women and girls. As I spent time in remote villages listening to the experiences of teachers, village elders, mothers and young women, I struggled with the disconnect between the theory and practice. Even if I could speak Nepali, I realised I could not articulate any answers to the questions raging in my head. Two years on from the devastating earthquake which destroyed roads, homes, and thousands of lives across the country, the less audible, but equally terrifying rumblings and upheaval of poverty and prejudice are still finding their victims. As in other parts of the world, the victims are disproportionately women and girls. I was in remote Nepal to see the work the charity I run is undertaking in re-building schools damaged by the earthquake two years ago. The human tragedy is well known with thousands of people killed. However, in terms of educational progress this earthquake was also a killer. In the Sindhupalchok district where we work with our partner the Helambu Education and Livelihoods Partnership (HELP) 470 of the 545 schools were destroyed. This is the region where we are working with local villagers in rebuilding 15 schools. By valuing their ‘sweat equity’ they are becoming equal partners with us and the government in the construction and ownership of these new schools. Furthermore, as we provide masonry training and make the building skills they need accessible, they are then able to use this new-found knowledge and skills as they set about the task of re-building their own more earthquake-resilient homes. However, we are not just building new schools. Working with our partners we are focusing on girls’ education and in the Helambu Valley we have created a number of girls’ hostels that allow them to board close by to secondary schools. This helps reduce the large number of girls in the region who abandon their education after primary level. The more support girls have to stay in education, the less vulnerable they are to child marriages, trafficking and the cycle of poverty that reduced education and early pregnancy perpetuates (3). With greater levels of education, girls and women will be empowered to live healthy, productive lives and to push for further progress within their own communities. This support extends longer term and to date we have provided 264 scholarships to enable students to progress into tertiary education, for this is the precious ‘window’ for this type of intervention. As Giulia explained to me, 49% of Nepali women aged 20 to 49 were married before their 18th birthday (4), and 17% of girls age 15-19 are either pregnant or mothers, with rural teenagers getting pregnant earlier than girls in urban areas (5). As I took a joyous photo of the hostel girls laughing, I reflected on the serious issue of what else was needed to help change a girl’s life. Yes, building a hostel for 60 girls is significant, but in the same way the process of involving local people to build the schools helps transfer building skills, does involving local people to build the hostel help dismantle some of the local attitudes and practices and educate the wider community on the rights of women and girls? Changing hearts and minds is harder to measure than assessing newly acquired building skills, but we believe there is a correlation. But there is more to do if we want to turn this safe hostel “fortress” into an amphitheatre of creative education and empowerment where the girls themselves are equipped to take the centre stage. One element which is often overlooked is to co-design an education and change programme amongst men and boys,for surely to answer the question “How do you change a girl’s life?” involves tackling the underlying attitudes and beliefs of men who hold power, both at the local, national and indeed international level. This is where it gets personal. As a man myself, how do I work for gender equality? I may have been born in India and brought up in Nepal, I may feel informed because I have a 19- year-old daughter, I may make all the right liberal noises of an enlightened ‘new’ man (taking my wife’s maiden name to join with mine when we got married), but do I really know and understand what it is like to be a girl growing up in Nepal today? Do I really comprehend the impact of gender inequality? Can our work be relevant to girls who are forced into early labour because of crushing family poverty? Am I able to really empathise with an adolescent girl who is excluded from her community at the time of her menstruation; (6) who has to walk hours each day to and from school; who lives in fear of being forced into bonded labour in a foreign country? Of course I can’t. Developing impactful education programmes involves helping those who hold power to both unlearn, and relearn what it means to be a girl. Yes, this is complex and as the commentators from the London Summit point out, we are all grappling to translate the theory to empower girls and provide sexual health care, into practical life-changing action on the ground. We can only do it through locally-led teams, who may not know all the answers to all the questions but know the people and come from the communities. Finally let’s remember the old proverb that “It takes a village to raise a child”. Today, through migration, travel and social media we are all part of this global village and can see each other sitting around the village square. Men and boys need to shift where they sit and girls, who are usually on the outer rim, need to start making their voices heard. Fear of failure and the enormity of these challenges must not deter us and each of us, right here, right now, must do more to help change girls’ lives for the better. (6) The practice of “chhaupadi” where menstruating girls and women are banished to animal sheds for the duration of their period is a complex and controversial issue, see BBC article. However, another teenage girl died in Nepal last week after she was banished, see Reuters article.